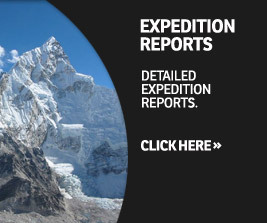 Grant aided by the Mount Everest Foundation, the Alpine Club, and receiving a 2013 Julie Tullis Memorial Award, a seven member AC expedition visited the Antarctic Peninsula, coming away with six first ascents. Led by experienced Antarctic mountaineer Phil Wickens and comprising Hannah Baker (recipient of the JTMA), Derek Buckle, Jamie Goodhart, Mike Pinney (all UK), Stefan Jachmich (Germany), and Bjorn Riis-Johannessen (Norway), the expedition travelled on the Spirit of Sydney to an unclimbed range to the north of Beaschochea Bay. Disembarking from the yacht, the team moved up the complex broken Trooz Glacier to establish a camp on the Belgica Glacier, below the peaks. There was much cloudy weather throughout the trip, but on the first day the whole team was able to make the first ascent of Alencar Peak (1,592m) by the northeast ridge, an easy snow ascent with fine views. The following day they climbed unnamed Peak 1,333m via the northeast face (AD), again a largely straightforward ascent, except for a large crevasse, crossed by a steep and elegant ice fin. The dominating peak of the area is Valiente (2,270m), further south. Utilizing a day of thick cloud to move camp up glacier, the whole team set off to climb it over a 2,032m snow dome. Baker, Goodhart, Jachmich and Wickens then continued onwards to make the first ascent of Valiente via the east ridge. A ski descent, followed by a re-crossing of 2,032m, made this a long, tiring day. Two days later came the first totally cloudless day, and the group elected to try an attractive mountain above camp, first skinning to a shoulder where they deposited their skis. Two successive ice slopes and a short ridge on the north flank brought them to the summit, and an altitude of 1,475m. The route was graded AD. The team then descended to the yacht in order to attempt the first ascent of the elegant Rio Branco from the southeast, unaware that on the same day a French expedition was making an ascent from the north. During their descent all team members skied the straightforward east (642m) and west (616m) summits of Lancaster Hill. Back on board, the weather now deteriorated, making further climbs too dangerous. With strong winds forecast later that week for the the Drake Passage, the group decided it best to return to Ushuaia (Tierra del Fuego) while conditions were still favourable.